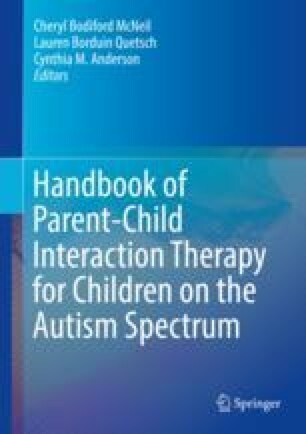 Despite the efficacy of Parent-Child Interaction Therapy (PCIT) for young children with autism spectrum disorder (ASD), problems with accessibility, availability, and acceptability have historically undermined the broad reach of this valuable intervention. For families of children with ASD, the extent of unmet health care needs is especially concerning—roughly one-third of children with ASD experience problems accessing quality care. Harnessing technology to reach families in their homes not only increases the accessibility of quality treatment, but can also offer additional benefits, such as maximizing the generalizability of care by treating families in their natural settings. In this chapter, we provide an overview of the rationale, considerations, and state of the research for utilizing Internet-delivered PCIT (I-PCIT), with a focus on the treatment of children with ASD. We provide a case illustration and conclude with a summary of lessons learned and future directions for I-PCIT for children with ASD.